Incredible Views! Shore and Pier Access! Gorgeous, private cottage with modern amenities overlooking Somes Sound and Sargent and Norumbego Mountains. Nestled privately in the woods on a natural granite ledge. 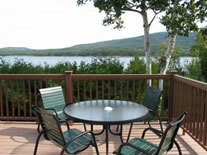 It's spacious furnished deck has stunning water and mountain views. There is a wonderful platform in the woods, overlooking the Sound, for sitting and relaxing, away from it all. It also features a two story granite gas fireplace; modern lighting; luxurious linens; whirlpool tub; flat screen televisions with DVR (Tivo); room darkening blinds throughout. Exquisitely decorated in soothing colors. 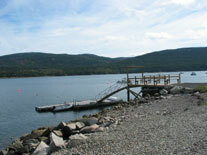 Full access to private dock and float; mooring rentals. Fresh lobster available for sale right off the dock! 1st floor-Kitchen, Dining area, Fireside sitting area, King bedroom (with gas fireplace), Bathroom with shower only, bunk room with 2 twin beds. Open airy floorplan. 2nd floor-King bedroom (with gas fireplace) has chaise lounge, chairs, and desk. 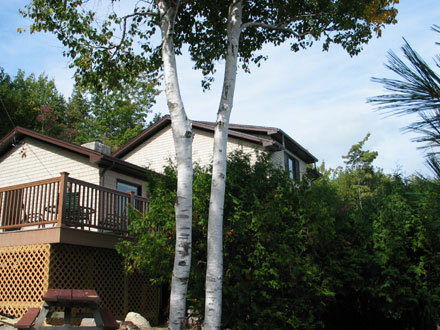 Enjoys spectular views, north to south, of Somes Sound. Also has Bathroom with shower and whirlpool tub. Small, crated pet considered. Inquire.